Hey Now, That’s A Fancy Mustang! People, the show was amazing! 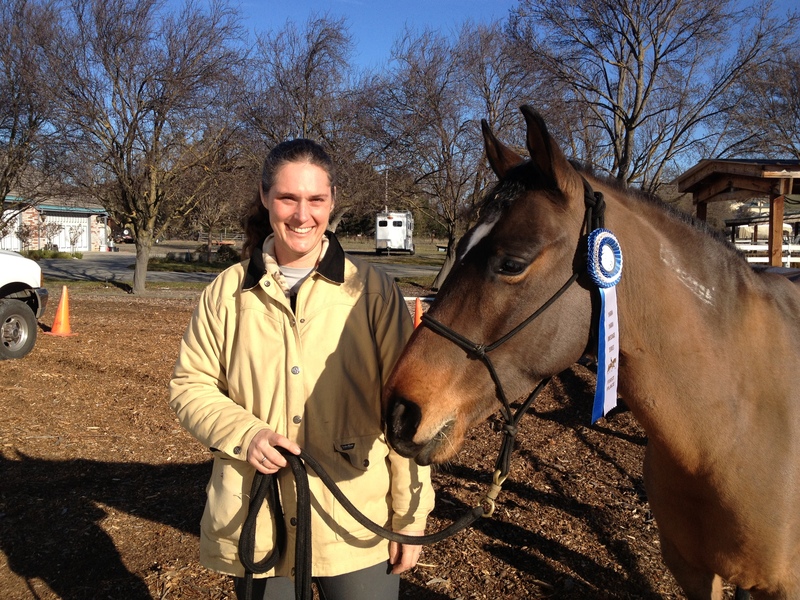 Sue warming up the best darn Mustang at the show. Also, the only Mustang. Sebastian was his usual self. Calm. Obedient. Hungry! 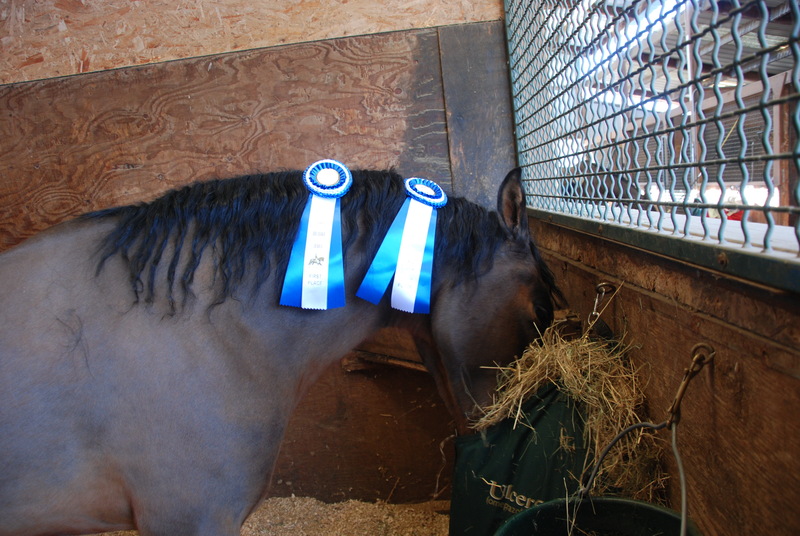 His stall was full of loose hay! Apparently, clandestine hay is way tastier. Things started off with a bang when he got a second in his warm up class! 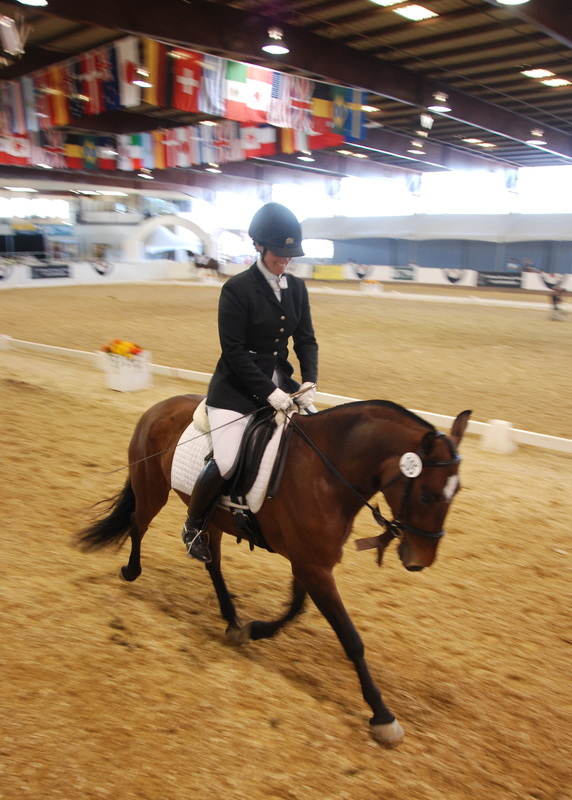 His remaining two classes for the weekend were very large (21 horses each) and full of fabulous horses. The competition was fierce! Each ride was judged by two judges, so it was fun to compare scores and comments between judges. In the USDF Regional Championship Class there were 15 horses above 70% and 2 horses above 80% (that many rides with scores that high is raaaaaaare), so I was crazy excited that Sebastian got an 8th with an average score of 73.9%! 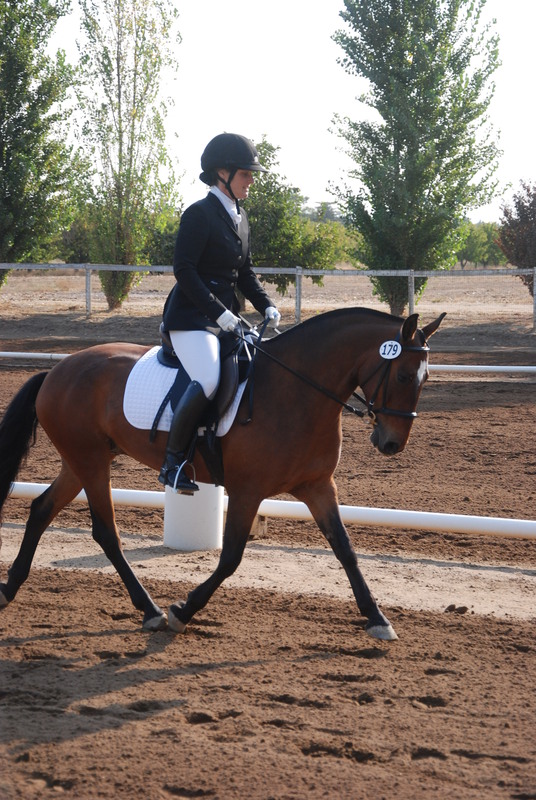 For The California Dressage Society Horse of The Year class there were two separate rides judged by 2 judges each, so in the end each horse’s score was an average of 4 judges’ opinions. According to all those judges’ opinions, Sebastian and Sue are an excellent pair! After the first class Sebastian was in second place with an average score of 74.7. Whoo hooooo! The best part of looking at the scores, however, were that Sue and Sebastian got a NINE on harmony between rider and horse not once, but TWICE!! Getting a 9 is crazy wonderful. Something that essentially never happens to the average rider, and very, very seldom to an amazing rider like Sue. And here it was- twice in one show! That is one special way to know you that you picked the right trainer. Oh yeah! So now Sebastian is home and riding him is such a joy. All the hopes I had for him going into training, to help him learn to move in the best possible way and mature his mind with lots of outings, have been greatly exceeded. Riding him now is like driving a sports car (albeit one with very eager brakes), as compared to the station wagon I sent to Sue. 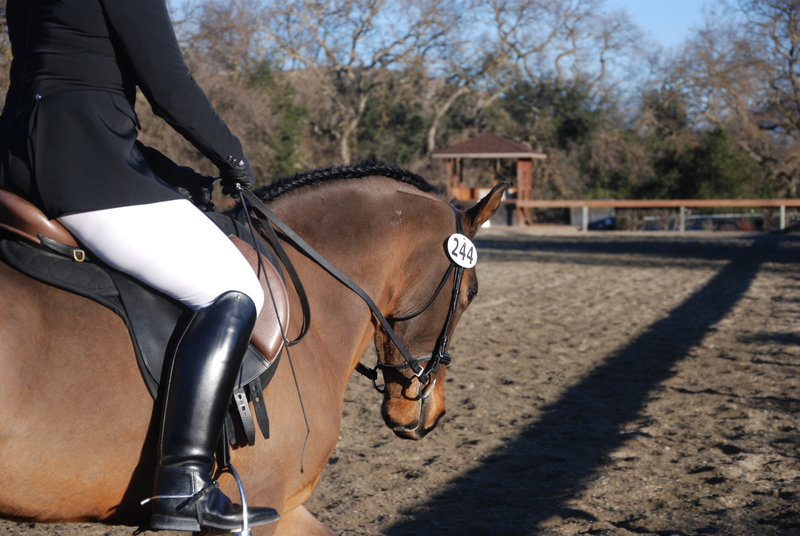 I’m even thinking that this dressage thing might be something that Sebastian and I can do together. I’m finding the precision needed to ride a good test to be both challenging and invigorating. It’s going to be my turn to start showing him in October. I must say it’s a little intimidating to show him in this new-to-me discipline after watching Sue ride him so beautifully, but I’m excited to try it out none the less. Here’s to at least not embarrassing myself next month at Greenville! 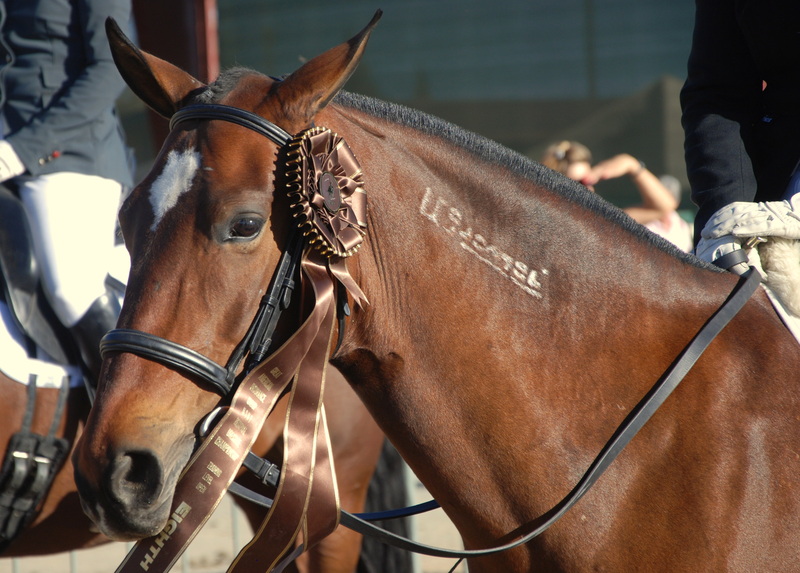 This entry was posted in Horses and tagged american mustang, dressage, natural horsemanship on September 30, 2013 by fullheartsfarm. Well, the summer was fantastic for Sebastian, the wonder pony, and Sue, his wonder trainer. 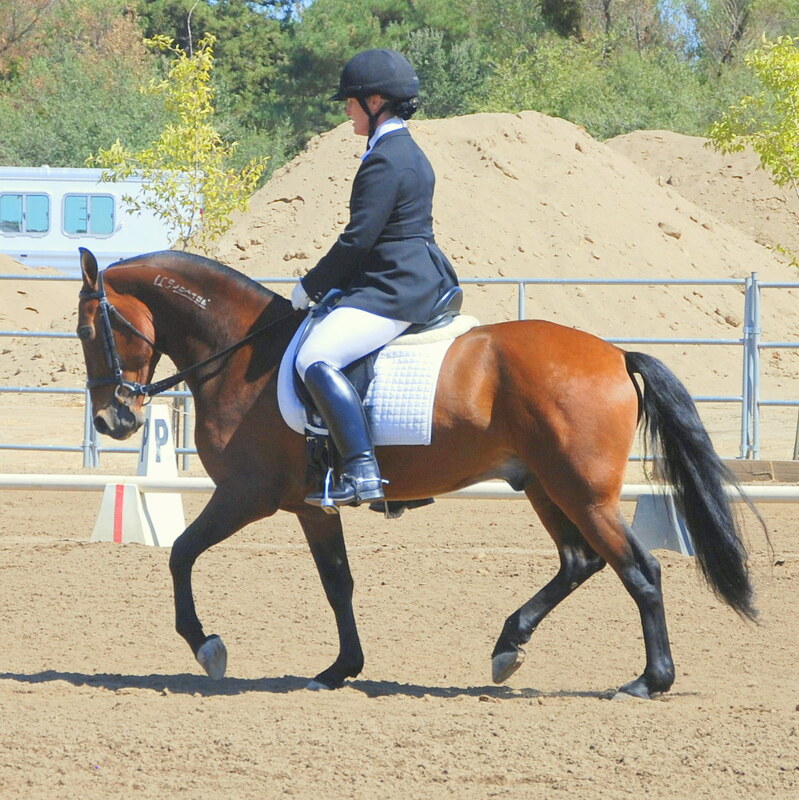 So fantastic, in fact, that we have decided to take him to the California Dressage Society championship show. I’m so proud of what Sue and Sebastian have done this summer. He hasn’t magically transformed into a giant, splashy mover (although his movement has improved a ton) but what he lacks in flash he sure gains in consistency. He was always 1st, 2nd, or 3rd in his classes. His median score at the moment, going into championships, is a 71.2%. 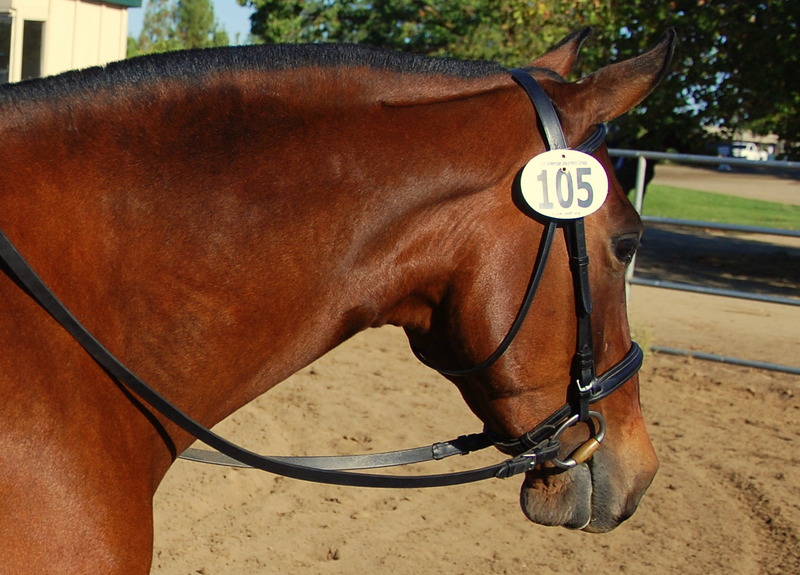 To a non-dressage rider that doesn’t sound that great (it’s not a C minus! 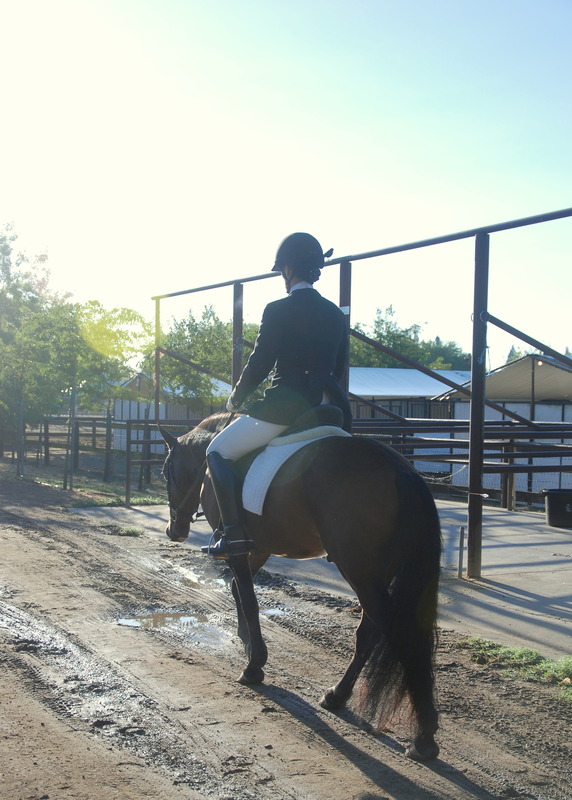 ), but in my intro to dressage showing this summer I have learned that that is a really good score! BTW, there is this amazing website, Centerline Scores, that lets a person totally nerd out on scores from dressage shows. I may, or may not, have looked up every horse in Sebastian’s class and found that, in fact, only two of his competitors have median scores higher than his. That consistency thing really works for him! I am keeping my expectations low, however. There are a good number of horses in Sebastian’s class who have gotten 78’s at past horse shows and everyone will be riding their very, very best. 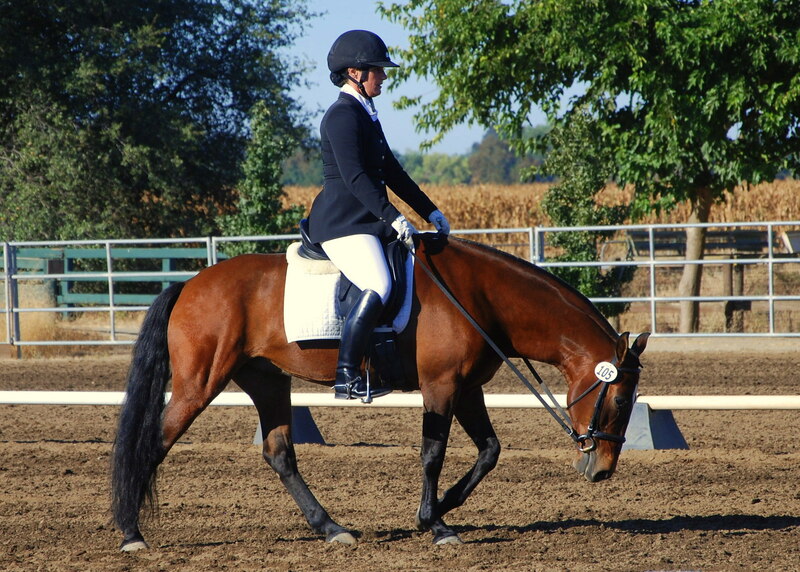 This show draws the fanciest horses from throughout the state and the classes are huge! No matter what happens, it’s an honor just to have him there and know that he earned his place among the European imports and soon-to-be six figure superstars. Stillwater’s Bastian, imported all the way from Nevada! The show is this weekend, September 19-22. Please wish us luck! 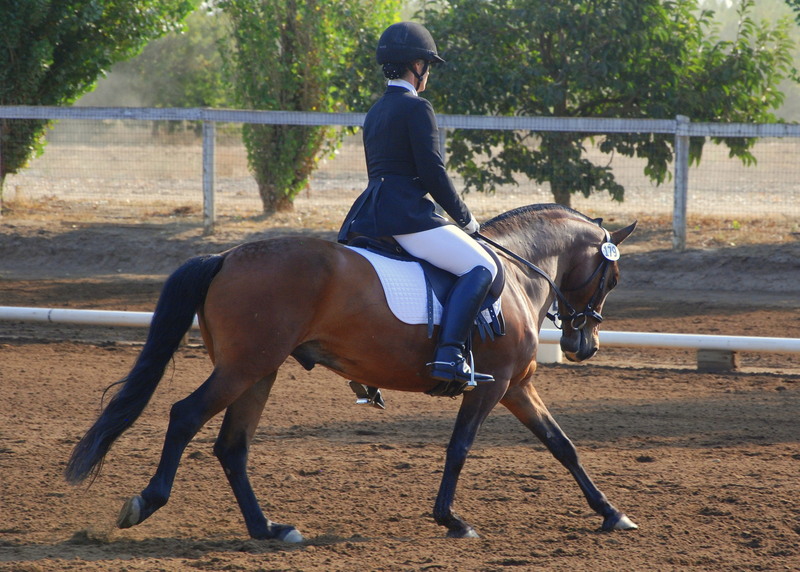 This entry was posted in Horses and tagged american mustang, dressage, horse, natural horsemanship on September 17, 2013 by fullheartsfarm. The Little Mustang Does It Again! I really, really thought Sebastian’s last show at Yarra Yarra Ranch was going to be a peak in terms of scores and ribbons. This weekend the competition was still at Yarra Yarra but with a new judge, on a new day. After his first test (Training Level, Test 1) the judge commented to Sue, my trainer, “Thank you. 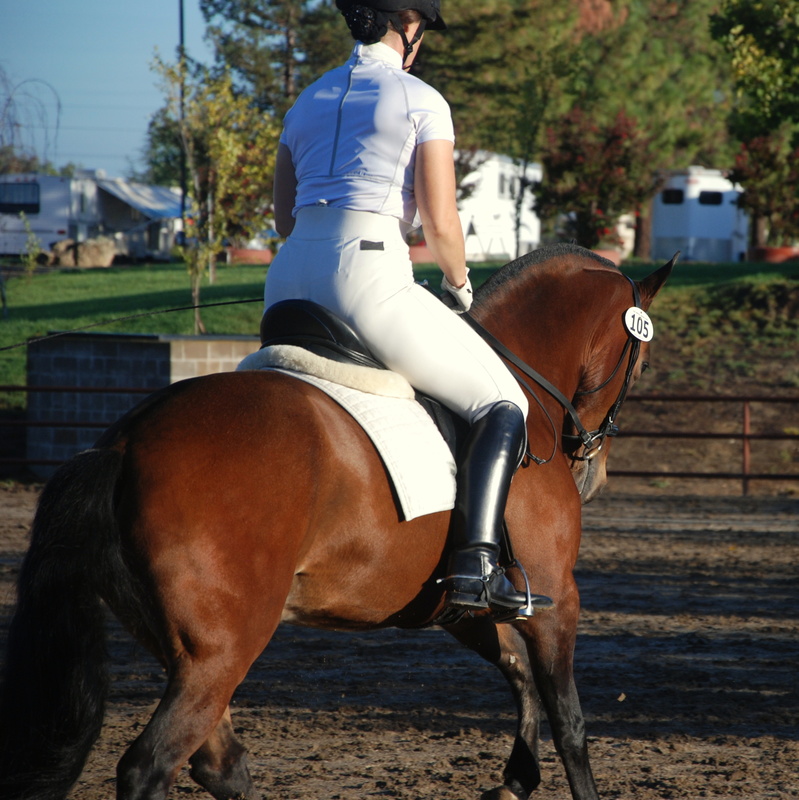 Lovely test.” as she rode out of the ring. This is a big deal to hear anything but a “Thank you” as you leave, the equivalent of “you may be excused”. When I heard “Lovely test” I began to have some hopes that things had gone very well. To my eye, the test looked almost flawless but, as you can imagine, I am somewhat biased. Low and behold, he scored a 75.8%!!! 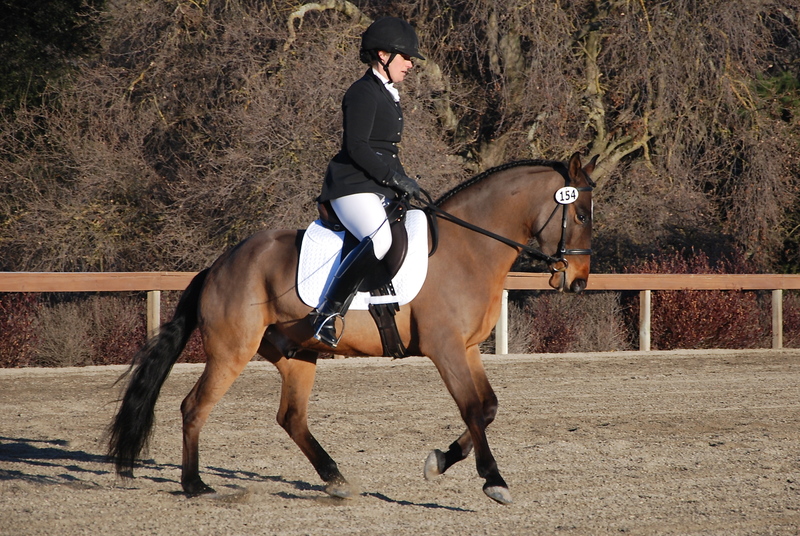 For all the non-dressage folks out there, that is *really* good. For his second test (Training Level, Test 2) he was not as forward moving, and we found out why when he finally pooped right in front of the judge’s table. As Sue later pointed out- nobody likes to run around when they really have to poop. So he picked up the wrong lead twice in the trot to canter transition required at that moment and scored a 3/10 for that move. 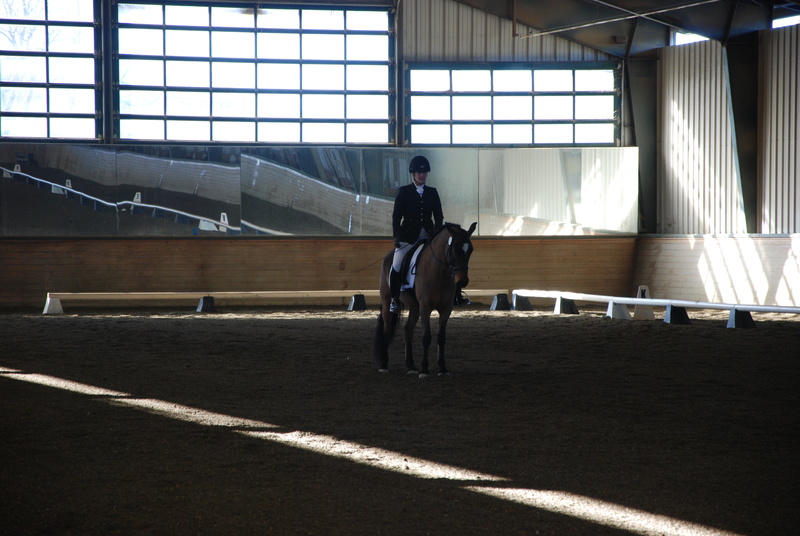 The rest of the test, however, was still awesome enough for him to score a 71.3% overall. So there is our victor, enjoying a net-free flake of hay in celebration of winning some totally useless (translation: inedible) floppy blue things his ecstatic mother smooshed into his mane. 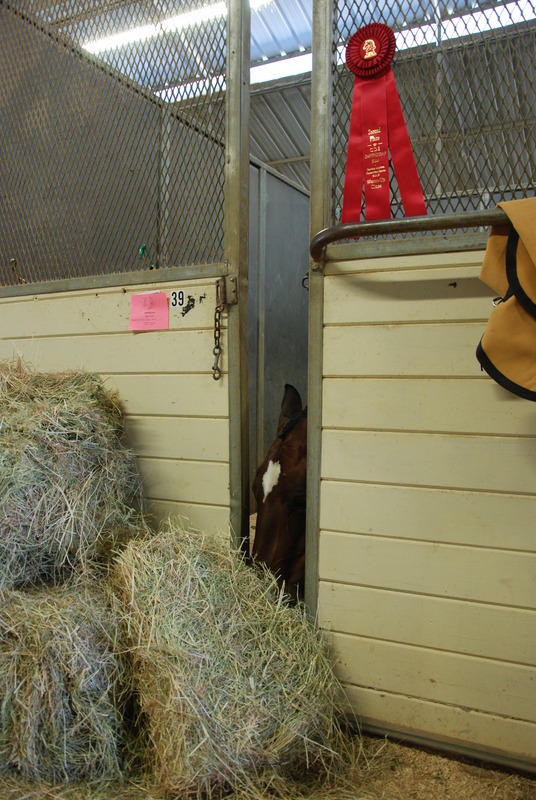 I had this super cute picture idea where I pinned the ribbons to the mesh of the stall door and was going to have him put his head out the v-shaped cut out between the ribbons, but of course he was too short to stick his head out. Alas, a small horse showing in a big horse world. On my drive home I was reflecting on the fortune of buying this wild little horse at auction and finding such success in the sports we have tried. There are the important factors of conformation bred through generations of hardiness and early conditioning in the rugged mountains of Nevada, but I also appreciate that Sebastian had time to grow up quite a lot before being handled by humans. There are horses who are fortunate enough to only ever interact with excellent horsemen who understand how to communicate the strange and often counter-instinctual things we ask of our ponies in a positive and effective way, but these horses are rare. 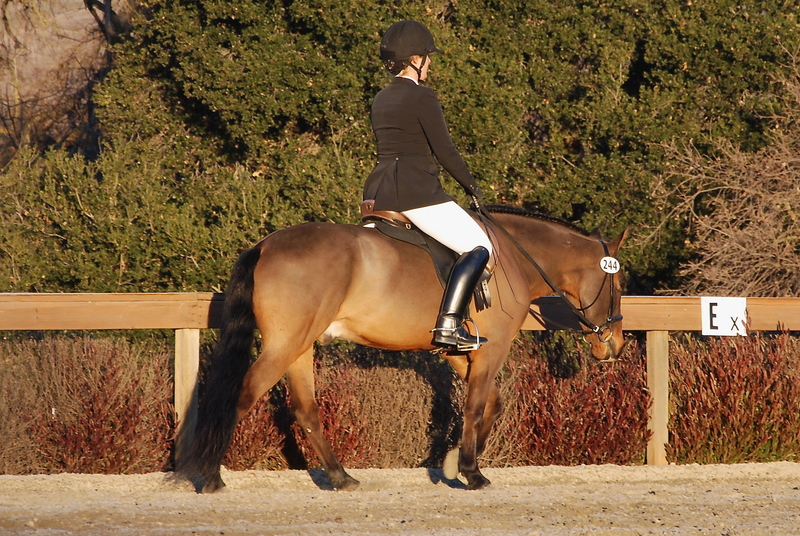 I looked for about a year before I bought Sebastian, and I found a number of young horses who would have been huge projects not because of their age or inexperience but because of the interactions they had had with humans. Buying a wild horse with 90 days of training from a natural horseman was actually an easy way to start a good relationship. Sebastian knows how to be a horse, first and foremost. 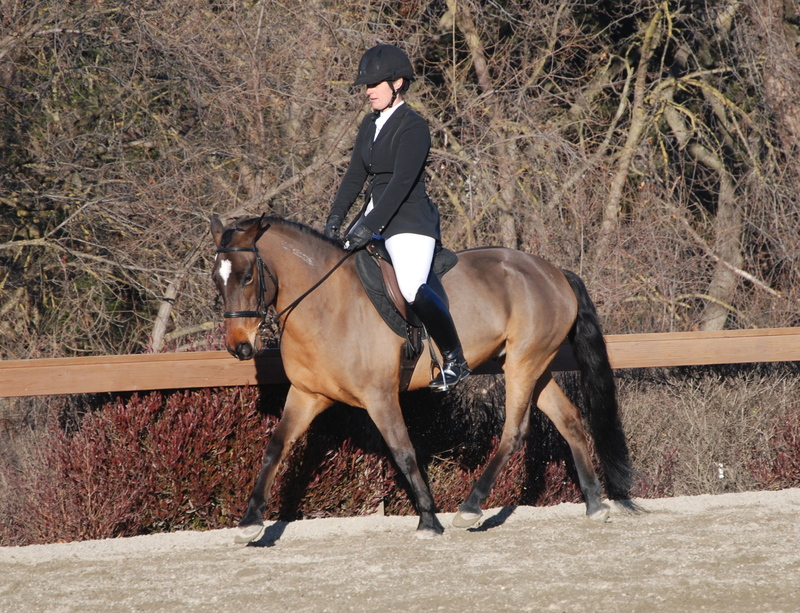 He has suffered from plenty of my mistakes over the past few years but he has a real training foundation (thank you Bob Mundy and Susan Dockter!) that has made everything else we have done so relatively easy. This next piece of dressage training with Sue Corrie is teaching him up to better use his body, correctly and efficiently. I have been fascinated to see how well this translates to show ring success when laid on top of his natural horsemanship foundation. 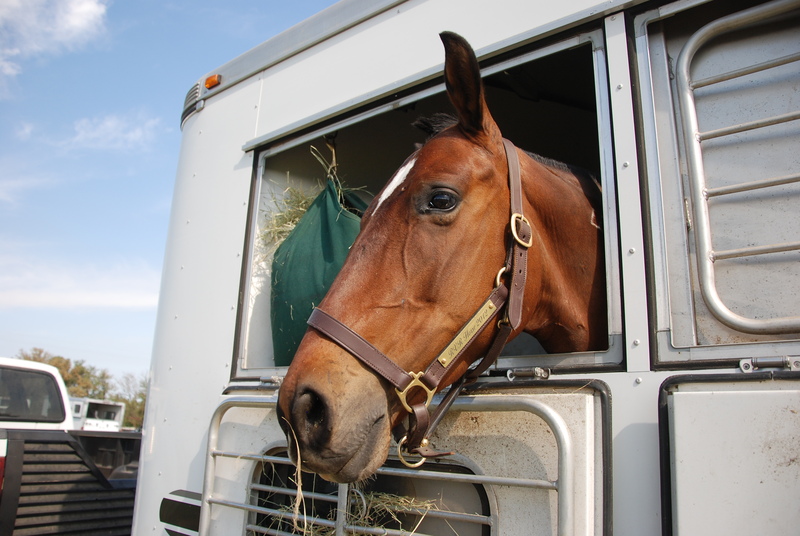 He unloads from the trailer at a show and looks around with curiosity, not anxiety. 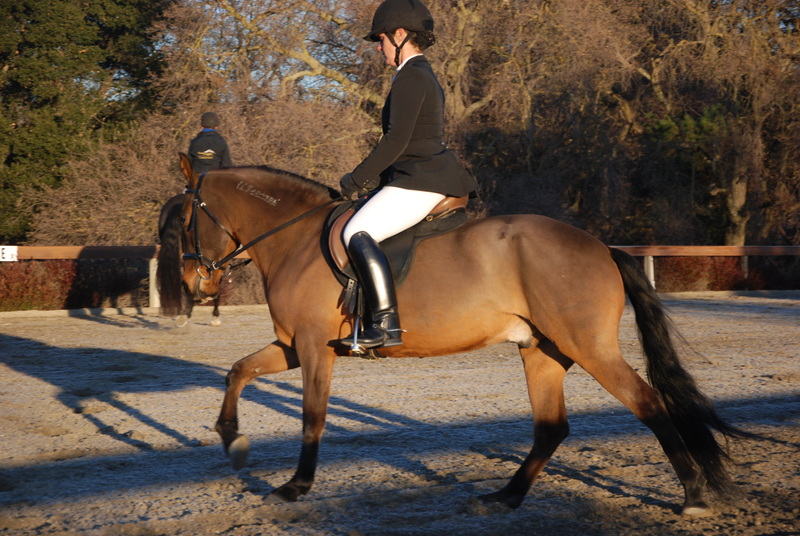 Sue can hop on without any ground work or lungeing and find that he is mentally the same horse she knows at home. He can really show off what he has learned with Sue because he isn’t nervous. Nope, he doesn’t have the movement to be competitive at the higher levels of Dressage but for me that’s an excellent trade off for a horse that is just so easy to do things with. Now watch, next show he’ll be a complete maniac because I tempted fate and wrote all those things down. I’m knocking on some wood here. I’ll let you know after March 30th- our next outing! 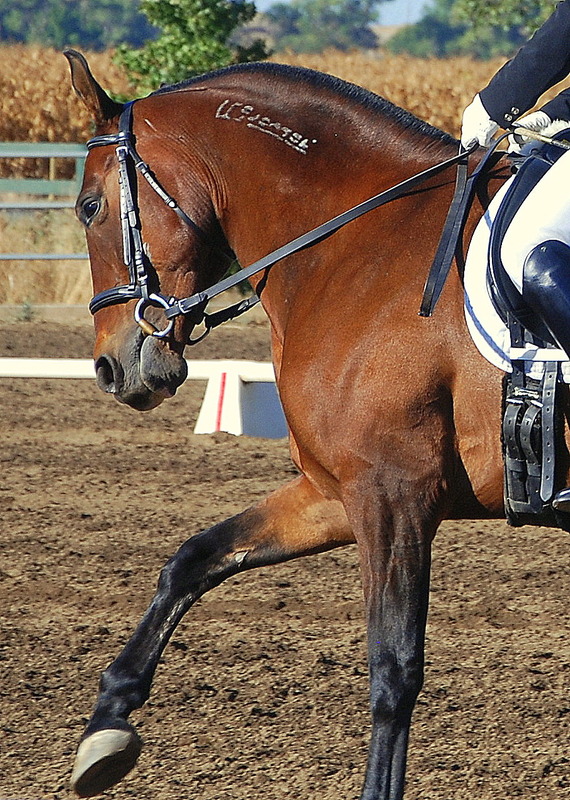 This entry was posted in Horses and tagged american mustang, dressage, horse, horse show, horsemanship, natural horsemanship on February 11, 2013 by fullheartsfarm.